The way to lower costs and increase the value of your crop. MANAGE LEAF VOLUME AND CLEAN BUNCHES. BERRIES DEVELOP THICKER SKINS EARLIER. – Two piece unit. Front mounted full row configuration, rear mounted blower unit. – Two piece unit. Front mounted twin defoliating heads, rear mounted blower unit. – Harvester or multi function over-row tractors only. Twin defoliating heads, hydraulic drive. Please contact one of our dealers for pricing. Rapid pulses of relatively low-pressure air literally shake the leaf to pieces and rattle the caps free of the berries. Listening to an E2200 the sound is similar to helicopter blades beating – this comes about due to the rotating nozzles discharging short sharp bursts of air (at 15 psi) onto the canopy. Looking at the stainless steel defoliating heads you can see a pair of curved slots (arc) in each one. Inside each defoliating head is a 4 nozzle cross (2 long & 2 short) mounted in a on a central rotary manifold. As they rotate the long nozzles follow the line of the outer arc and the short nozzles follow the inner arc. When these revolve the pattern is long, short, long, short…. And, if you put your hand in front of the nozzles you would feel the pressure point rapidly alternating between two points on your hand about 50mm apart. It is this alternation that makes the leaf flex rapidly and shatter, dislodges the caps from the berries and clears the debris from the bunch. Defoliation AT SETTING is the time to direct the air into the fruit zone because the small berries are well spaced and quite tough. This is the time to remove caps and clean bunches. The defoliation head is set parallel to, and 50-75mm from, the vertical face of the canopy with the pressure band on the fruit zone. This position effectively removes leaves along the fruit zone but allows the canopy immediately above it to mature and to perform the vital photosynthesis. This lets the gentle morning sun onto the fruit so that the skins develop without burning. The ‘step’ created above the fruit in the canopy helps to provide shade from the mid-day sun. As the time of bunch closure approaches the method is to raise defoliation heads so that the pressure band is just above the fruit zone. Now the defoliation effect is to let the sunlight onto the fruit when the sun is higher and more intense. This is a safer practice because the berries have been well managed during their early development. To remove more inner leaves, the defoliation head can be pushed into the canopy 50-75mm BUT the pressure band must be above the fruit zone. After veraison and for hand thinning the defoliation head should be declined and above the fruit zone so that the canopy is opened to make it easier to see the bunches. 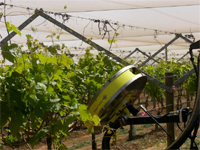 The Collard Pulsed Air System produces a high volume of air – this wind clears the shattered leaf from the canopy and out into the centre of the next rows. A very small amount of debris can drift and settle in the canopy but it quickly dries and will shake out with the movement caused by the wind. A big issue with competing mechanical leaf pluckers is fruit damage. This is due to guide rollers pressing on delicate bunches or the bunches projecting outward into the fruit removal leaf cutting blades. 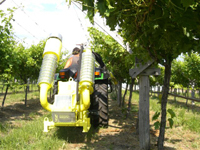 The Collard Pulsed Air System does not need to press onto the canopy – it works up to 150mm away. The Collard Pulsed Air System does not have cutters or rollers. When comparing the Collard Collard Collard Pulsed Air System to hand-plucking or any one of the suction-cutter types of leaf plucker consider the following advantages. Can be used early – at capfall. 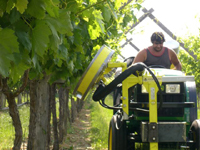 The machines can be adjusted from the tractor cab to allow for variations in row width and fruit zone height using the electric-hydraulic controls. This provides for independent adjustment (L & R) of width and height. a high quality air booster (Rootes Blower) and gearbox (540rpm input). 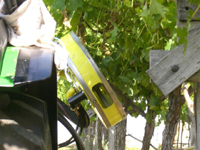 Grape growers, like any business, must always look to increasing, or at least maintaining, their margins. Leaf ResearchOn the input side they must reduce operating costs by becoming more efficient. On the output side they must work to increase the value of their crop. Leaf removal is a key aspect of canopy management that will contribute to both objectives. 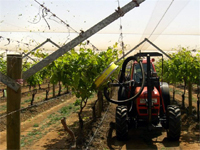 Improve spray penetration and therefore application rates can be better regulated. Early opening extends the time that these benefits will apply and increase the savings of chemicals, manpower and tractor time due to lower disease pressure. It may also make your crop more valuable. Typically the earliest time to do any leaf removal is at fruit set. This results in the berries being presented to sunlight early in the season, when the risk of sunburn is less. Because the berry is exposed for longer the skin develops to be thicker and the berry is firmer at veraison. Early leaf removal results in the berry developing and functioning better. This is evidenced because it improves the synthesis of POLYPHENOLS and ANTHOCYANIN. Sensory ‘analysis’ on vines that have early defoliation done (at setting) shows more complexity, better tannic structures and more balance. As a wine your early-defoliated crop will have greater appeal and a better market value. Since it is worth more to the wine retailer in turn this justifies paying the winemaker for his exciting product. The winemaker will seek out your grapes and pay you the premium earned from your investment in early defoliation. In 1983, Maurice Gallay, a designer working in the Loire Valley developed the original Collard Pulsed Air System for stripping the leaf prior to harvesting. It was very successful because the bunches were easier to see the labourers could work faster. Maurice manufactured this machine under the Galvit brand. For many years this was the only application of the system. Then Maurice and some of his clients experimented with using it to prepare the canopy prior to bunch thinning. This also proved successful. Hundreds of machines were delivered in the Champagne district; this sales success was based on the thinning and hand harvest gains. The most significant advance was when EARLY DEFOLIATION was discovered. 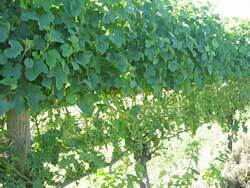 Growers reported better control over botrytis and generally better flavours. Interestingly the machines were not widely publicised outside France and only in 2001 did the first machines get exported. 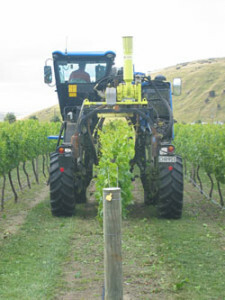 New Zealand was one of the first to get an exported machine. 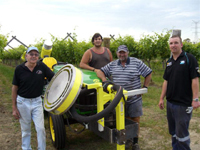 Michel Collard and Maurice came to Marlborough in November 2001 and worked with the first Collard Pulsed Air System machine at Terry Sowmans Red Birch Vineyard on Hammerichs Road. Terry purchased a machine in partnership with David Rose (Rose Agricultural Contractors) for the 2002-3 season. 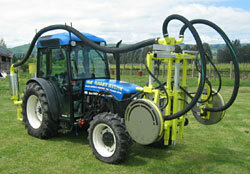 Rose Ag now owns this machine and Terry took delivery of his own machine in October 2003. In the 1990’s French wine authorities monitored increasing use of the practice and varieties of methods of defoliation. 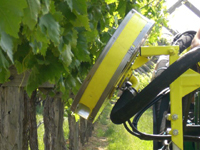 In its efforts to help the French wine industry ITV France established a national monitoring programme to ensure good practices were identified and promoted and that the projected benefits were achieved. The ITV project has found that leaf removal is frequently over-done. One thorough and early pluck, on the sunrise side of the canopy. Development of vegetation & berries. Single face defoliation does not cause a decrease of the vegetation surface exposed because it lets the sun through to the internal leaves of the other face. Two-face defoliation causes a nett loss of the plants photosynthesis capacity. Reduction in photosynthesis capability from defoliation AT SETTING is partially compensated for by growth of lateral buds. Firmer fruit on vines defoliated AT SETTING as measured prior to veraison than fruit on vines defoliated later; at, or near to, closure. Thicker, stronger skin on fruit exposed AT SETTING than if done later. This shows as a greater resistance to grey rot. The thicker skin reduced the incidence of sunburn as compared to fruit that is exposed later. Higher levels of POLYPHENOLS and ANTOCYANIN were found in grapes that had early defoliation. Two-face defoliation did not give a significant qualitative profit. Sensory analysis comparing wines produced from early & later defoliated grapes shows early defoliation to provide more complexity, better tannic structure and greater balance. On sites where there was high disease pressure defoliation limited the development of the grey rot. The best control was achieved on vines defoliated AT SETTING. Defoliation of two sides did not bring an improvement to the control of the disease. 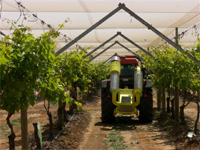 In seeking to improve control of Botrytis with defoliation as part of the strategy the best results were achieved by defoliating AT SETTING. Leaving defoliation later reduces the benefit. Defoliating two faces at setting did not improve control. 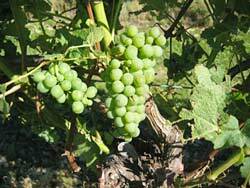 If defoliation is left late – closure or veraison, then at this time defoliating both sides improves the result. Use of the Collard Pulsed Air System AT SETTING ensures removal of the majority of the floral caps. If these remain in the bunch after closure they increase the risk of Botrytis occurring significantly and increase the difficulty of managing the disease with sprays. The Collard Collard Pulsed Air System also removes parasites from the canopy.